A few days ago, Linda was poking around on the internet, visiting a few horsey websites. She happened upon a link to Heaven Can Wait Equine Rescue. They’ve been around for years, and she peeks at their list of adoptable horses every once in a while. So she dropped in for a look. There was a lovely old chestnut thoroughbred pictured. “Oh what a lovely sort of horse” she thought. Then she read the description. “Casey Cobalt” was his racing name. “WHAT????? CASEY????? ?” Casey is Wise Affair‘s older, full brother. Out of Ron’s classy old broodmare, Exclusive Affair and by Whiskey Wisdom. He is 17 years old, and as far as we knew, he had been in a good home with the same owner for many years after his retirement from racing. 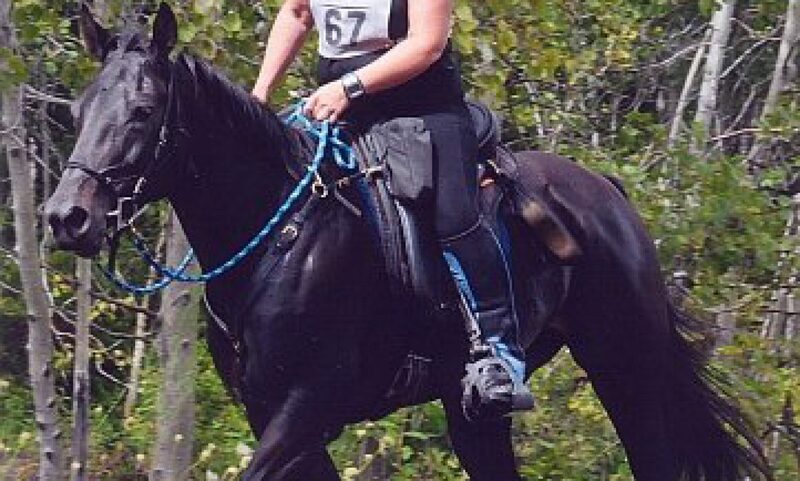 He was a competitive dressage horse for a few years. So that precipitated a mad scramble to get Casey home. Linda notified Ron and called the rescue right away to give them references and arrange the adoption and transport. He arrived two days ago. He appeared to know where he was as soon as he got off the trailer. He’s not perfectly sound, though we won’t know for sure what’s going on with that until the vet checks him this week. He’s still considerably underweight (scary to think what he must have looked like when he first got there a month ago!!) And he’d managed to bang his eye just before getting on the trailer (Claire at the rescue was appalled that he did that right before she sent him out, but it’s not serious, and she doctored it up nicely before loading him). So with all that, he was a bit of a sad sight compared to the big, handsome racehorse that left the farm years ago. He’s been going out into the arena for turnout, since he’s being quarantined for a while. Today, he whinnied and Parker (who is the oldest of the retired no-goodniks in the “cute and useless” pasture) seemed to suddenly realize WHO was calling in the distance. He whinnied back in great excitement and galloped to the gate. “Hello!!!!! CASEY!!! Is it you?? ?” “Parker? PARKER???? It’s me! Is it you????? ?” Lots of crazy enthusiastic whinnying. Then, of course, there were some silly antics in the arena. He might be a little sore, but he remembers his glory days. He is eating well, and I’m sure he’ll put the weight back on without too much trouble. On another note… when you have an off-track thoroughbred, do not just assume that his breeders, owners, and other racing connections do not care what happens to him in the end. Not all will want them back (just as with the rest of the horse world). But you might be surprised by how many actually will either take them back or try to find a good place for them somewhere. Casey was never a throwaway horse. After retiring sound from racing, Ron sent him for a few months of professional training so that he would be more likely to find a good buyer who would love and care for him. And he thought that he HAD found a good owner. Things happen for sure. Death, divorce, job losses. We don’t know what happened, or how many hands he’s passed through, but unfortunately for Casey, no one ever thought to ask if he could come home. He’s home now though. And he’s staying.